Where do dragons live? What do orcs eat? How do gnomes spend their free time? Learn the answers to these questions and more in All About Fantasy Creatures. Using a fun and easy-to-use reference guide format, fantasy fans can quickly learn all they want to know about their favorite fantastic creatures! 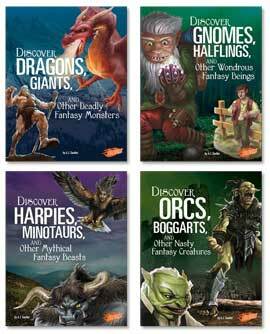 Features include fun quizzes to challenge readers on their knowledge of fantasy creatures. Where do red dragons like to make their lairs? How tall do mountain giants grow? What happens when a cave troll is exposed to sunlight? Want to learn all about these fantastic creatures and how they live? Look no further! With this easy-to-use reference guide, fantasy fans will become experts on deadly fantasy monsters in no time! How long do elves live? What are the differences between gnomes and dwarves? When are brownies the most active? Want to learn all about these fantastic creatures and how they live? Look no further! With this easy-to-use reference guide, fantasy fans will become experts on wondrous fantasy beings in no time! What kind of food do harpies like to eat? How fast can a Pegasus fly? Where do minotaurs and gorgons usually live? Want to learn all about these fantastic creatures and how they live? Look no further! With this easy-to-use reference guide, fantasy fans will become experts on mythical fantasy beasts in no time! Why do boggarts have such a nasty reputation? How quickly do orcs grow into adults? What happens to the land around a hag's lair? Want to learn all about these fantastic creatures and how they live? Look no further! With this easy-to-use reference guide, fantasy fans will become experts on nasty fantasy creatures in no time!